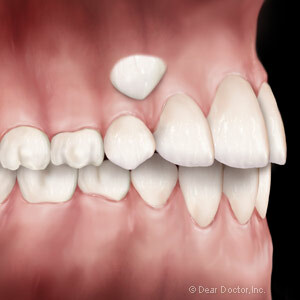 If you want to correct your crooked smile but are hesitant of fully committing to braces, Drs. Stephen Wilk and Jeffrey Revoir at Artistic & Family: have the answer: Invisalign! Offered at their Denver office, this leading-edge orthodontic system uses clear aligners to discreetly change smiles. The Invisalign system remakes crooked smiles, corrects alignment, and raises aesthetics, all through the use of clear acrylic aligners. These invisible, custom-crafted appliances come in pairs and gradually reposition teeth in about one year. While your smile is "under construction," you may remove your aligners to eat, brush and floss. With Invisalign, your mouth will be comfortable, and you can eat the healthy foods you usually enjoy with no restrictions. Dr. Wilk or Dr. Revoir will help you determine if you'd benefit from treatment with Invisalign. During a consultation, you will undergo a complete examination and screening. Then, your dentist will create a care plan which actually shows you what your smile looks like at each stage of treatment. Most patients wear sets of 18 to 30 aligner pairs, each in a sequence determined by their dentists. You'll find the aligners fit snugly and truly are discreet in appearance. You may remove them for easy maintenance, and you'll receive new aligners when you check in at Artistic & Family Dental once a month. As treatment progresses, you'll notice quite a change in your appearance. In the end, a retainer keeps your teeth in proper alignment. While most orthodontic patients (80 percent) are children, usually of middle-school age, smile correction does not depend on how old you are. The American Association of Orthodontists states that treatment happens at any time throughout life and that one in five orthodontic patients are now older teens and adults. Invisalign appeals to many adult patients because the care plan doesn't interfere with their lives. No one notices the appliances, and the treatments are shorter in duration than with metal, lingual, or ceramic braces. Do these Invisalign features appeal to you? At Artistic & Family Dental, Dr. Wilk, Dr. Revoir, and their team enjoy making people smile with confidence and vibrant health. Find out if Invisalign could help you reach your smile goals by calling our Denver office at (303) 758-2980.